Electric Wilds is one of the most original-looking games, featuring nine individual 3D reels which you can see spinning individually, as the reels are stripped down to the bare mechanics. It’s all about the power of electricity in Electric Wilds, and you best be prepared for shocking wins! The base game features 3D reels with multiple in-game cameras, giving you a unique gaming experience in many ways. Add to that atmospheric sound effects and bright, neon colours and you have a game like no other! There are 3 reels and 3 rows on Electric Wilds, with just 5 paylines and a good RTP rate of 96%. Electric Wilds boasts an original Lightning Overprint feature, a Super Overprint feature and wild substitutions too! Electric Wilds has just 5 paylines but the betting range is very varied for this old school-style gem. You can play from as little as € 0.1 per spin or you can increase your bet all the way up to the maximum of € 500. The symbols on Electric Wilds are simply. There are three different-coloured electricity tubes and a female robot’s head. Four playing card symbols – A, K, Q, and J – make up the lower value symbols on the reels. The wild is a neon title symbol and this substitutes for all other symbols on the reels to form winning combinations. At the end of every spin, there is a chance that an overprint can appear on the bottom right hand side. When an overprint is in view, it will light up the corresponding position on the 3x3 matrix display that you can see next to the reels. Every line (whether vertical, horizontal, or diagonal) that’s lit up will turn one symbol wild. If you have multiple lines lit, multiple symbols will go wild! Each time a line is lit, a decision will be made as to which symbol will go wild and this is all displayed in the dot matric display underneath the 3x3 mechanic. When multiple symbols are chosen to go wild, you can see the history of each symbol chosen on the dot matrix display. At the end of each spin, any lightning overprint that is lit on the matrix has a 50% of being held over. Symbols can only be held over once. There is a chance that a super lightning overprint (a red lightning symbol rather than a green one) may land on one of the reel symbols at the end of every spin. This symbol looks like the normal overprint symbol but it will add a random number of lightning overprints to the matrix instead of just one, greatly increasing your chances of lighting multiple lines on the matrix! Northern Lights Gaming decided to skip the free spins and create something more original in the form of lightning symbols, wild substitutions, the Repeater bonus and the Super Overprints bonus! If you fill a whole window with the same symbols, you’ll enter the repeater bonus! You will enter the bonus with the amount won from the base game and you’ll have the chance to win that amount another 4 times. In the Repeater bonus, you’ll be presented with five old electric tubes, one of which will be broken while the other four are not. When you press the start button, the electricity will move across all five tubes and stop on one. If the electricity stops on the broken tube, then the bonus is over. If it stops of a non-broken tube, then you’ll win the same amount you won when you entered the bonus. This winning tube will now break, decreasing your chances of getting a repeat. Press the start button again and the same process will occur until electricity stops on a broken tube. The bonus amount is then awarded, and the bonus ends there. The paytable in Electric Wilds is a dynamic one, so you can see the prize value for each symbol according to your bet. Regardless of your stake, the wild and the female robot are the most valuable symbols, each worth 20x your bet. The pink electricity tube is the highest paying symbol out of all the tubes, worth 10x your bet. The yellow and green tube are worth 8x and 6x your stake respectively. The lowest payouts come from the playing card symbols, with the A and K worth the most at 4x your bet and the Q and J worth 2x your bet. Electrical zaps and roaring lightning are constantly heard in the background, while the logo of the game is constantly shocked by electricity. While the sounds set the scene perfectly, the design of the reels is also brilliant, being stripped down to wires and metal fixtures. On the right, you’ll see the unique 3x3 matrix. Underneath that, you can access the autoplay option and the paytable and information of the game. Electric Wilds is the most super-charged looking game we’ve ever seen! The electricity theme is really original, along with the 3x3 matrix and the unique design of the reels. 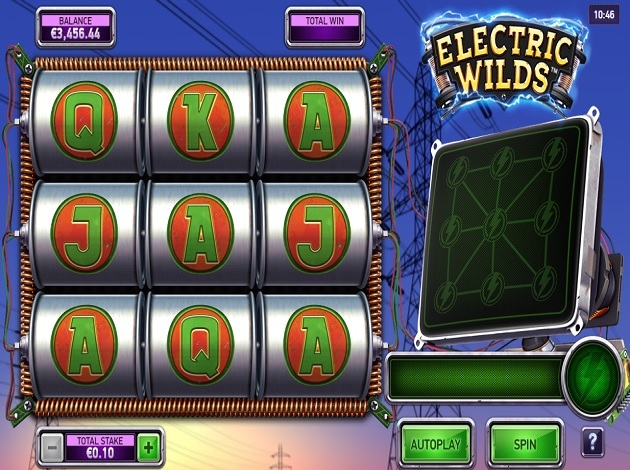 Spin the reels of Electric Wilds for a shockingly good time with electric wins and features!